Strawberry Upside Down Cake ~ Delicious Upside Down Strawberry Cake that starts with a box cake mix and is infused with fresh strawberries! This is perfect for entertaining guests or just because you want something sweet! So easy anyone can make it! I just totally fell in love with this Strawberry Upside Down Cake again! 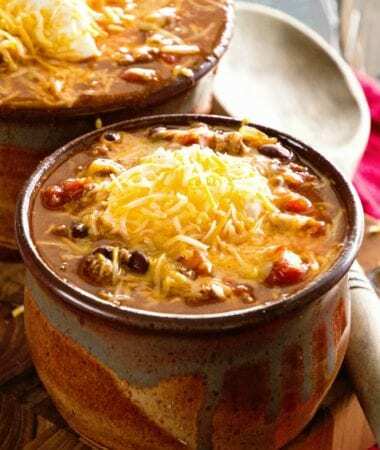 I forgot how easy it is, how delicious it is and how impressive it is when served to your family and friends! It comes together so quickly and looks so impressive. 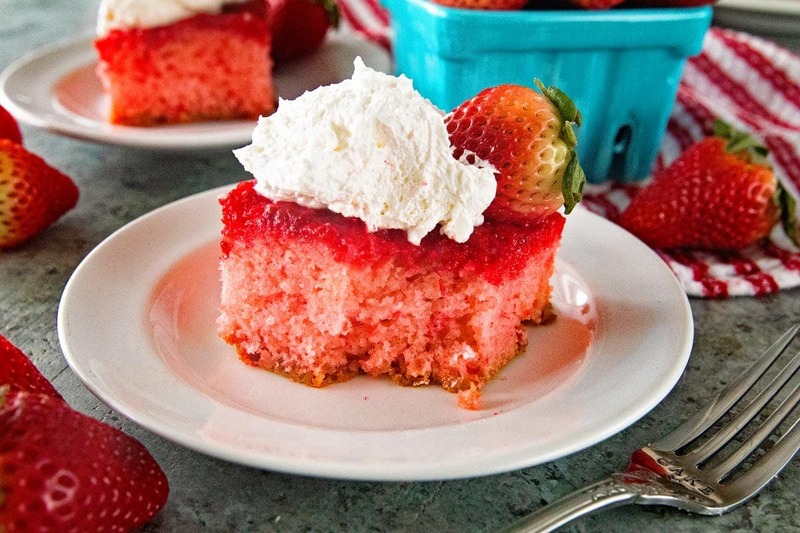 You start with a strawberry cake mix and add in a few secret ingredients like marshmallows, strawberry jell-o and fresh strawberries and it turns into this fabulous upside down strawberry cake perfect to impress someone with! 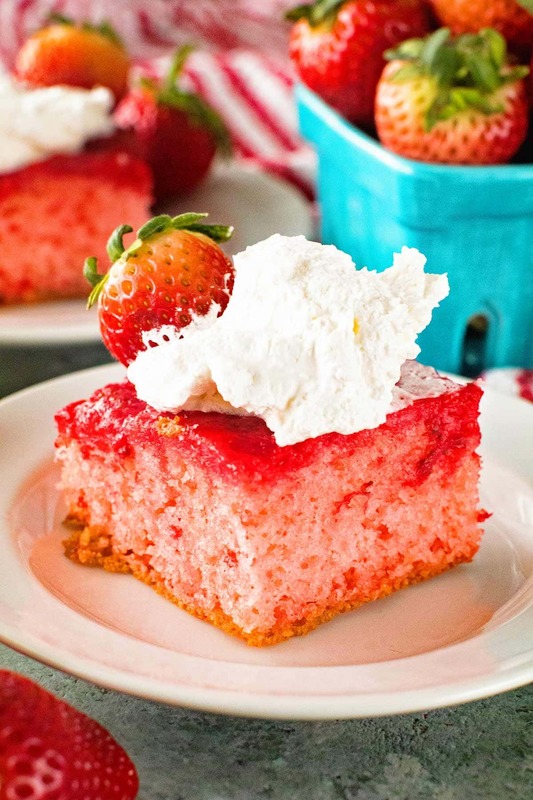 It ranks right up there with this delicious strawberry yogurt cake! Ingredients Needed to Make Strawberry Upside Down Cake! I was introduced to this cake in the following story. One day I arrived at work. More than likely not in the best mood and still waiting to kill my first cup of coffee. Then in walked a coworker with a piece of cake his wife sent for me. Then my day instantly got better. It was this strawberry upside down cake! I inhaled it, then promptly sent his wife a Facebook message for the strawberry upside down cake recipe. This is the cake. So I encourage you to do the same. While you might not be able to inhale it and then send me a message. I highly encourage you to run to the grocery store, grab the ingredients and make this for your favorite someone or for yourself. I have no judgement. None at all. You do what you want with this cake. If that means grabbing a fork and sitting down and eating half or all of this upside down strawberry cake then do as you please! I guess this cake is a standard recipe a lot people know about, but I was not in the “know” about it so now in case you aren’t either I’m letting you get in on the know! It feels good to be in that club doesn’t it? I sometimes feel like I live in my own little bubble! Now that we are all smart and on top of things go about your regular duties today as long as it includes this cake. Life will be better with this cake. I promise! Tools Helpful When Making Strawberry Upside Down Cake! Who’s excited to try this Strawberry Upside Down Cake Recipe? 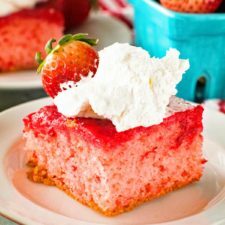 A few of my other favorite easy cake recipes are Strawberry Vanilla Poke Cake, Easy Strawberry Cake, and Oreo Poke Cake! Strawberry Upside Down Cake ~ Delicious Upside Down Strawberry Cake that starts with a box caked mixed and is infused with fresh strawberries! This is perfect for entertaining guests or just because you want something sweet! So easy anyone cake make it! Take your two cups of strawberries and crush them with a fork. Pour into a greased 9x13 in cake pan. Sprinkle strawberry Jell-O over the top of the strawberries. Then sprinkle the marshmallows over the Jell-O. Bake at 350 degrees for 40-50 minutes or until cake tests done. Let sit for about 15 minutes and then run a knife around the outside of the cake. Flip onto a serving tray. Refrigerate. Serve with Cool Whip. Store leftovers in refrigerator. Looks delicious, I’m gonna try it for my daughter’s birthday. She loves strawberries.. Wahoooo!! Glad you enjoyed it! I made this the other day and yes the middle was hard to get done but I also noticed when I took out of oven there was a lot of liquid in the bottom of pan so I let it cool completely and the put in the refrigerator to let the jello set took it out and it turned out beautiful when I flipped it over just a helpful hint….. So interesting that happened because I’ve never experienced that! Glad it turned out ok in the end! I think this would work fine. I would make sure to thaw them. I’m sorry Cathy I haven’t tried it that way! Thanks for letting us know this Jacki! Hope you enjoyed it Shirley! I made this cake. I aeeume it must be refrigerated? 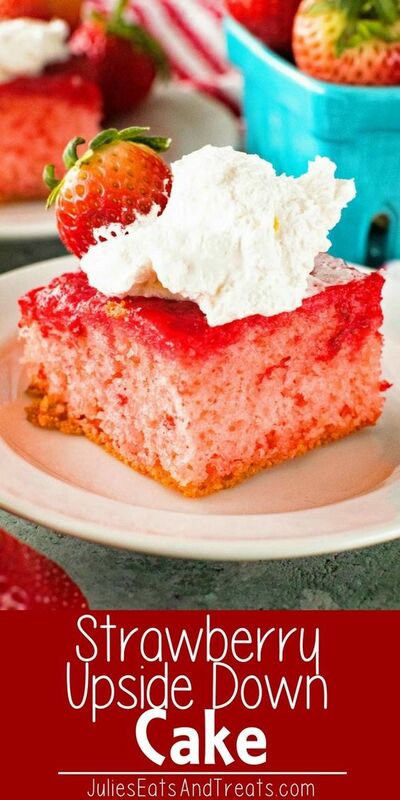 I love this recipe but I never thought about using strawberry cake mix, yum! I love the pan you are using, do you remember the brand? I think I got it at Target! 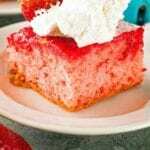 Strawberry Upside Cake is so easy to make and delicious! My family ate the first cake. Going to make again and surprise everyone at work! Love your website! Great ideas and recipes! It’s in the oven now, smells so good! do you mix the strawberry jello first or use the powered mix ? 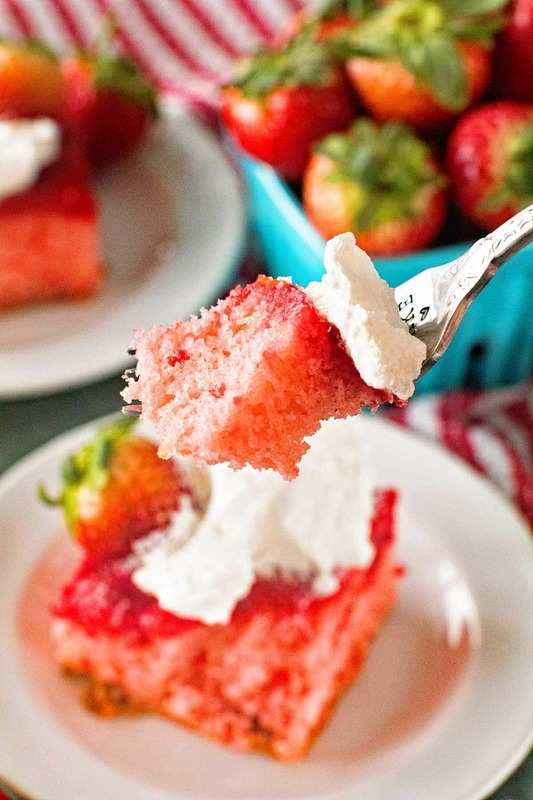 Can you use white cake mix instead of strawberry? Yes it just won’t be quite as much “strawberry flavor”. How long does it need to be refrigerated before serving? I would guess about a hour! I forgot the marshmallows….will that affect the results? Yes that is an ingredient so it’s necessary. Do you have to use any type of baking spray so cake does not stick. Can you make this a day ahead of serving? I can only find a 15.25 oz strawberry cake mix. Is the 18.25 correct on the recipe?